This delayed acceptance can be attributed mainly to initial concerns regarding the adequacy of oncologic margins and trocar site recurrences believed to occur with laparoscopy—concerns now largely laid to rest by the results of large randomized controlled trials such as the Clinical Outcomes of Surgical Therapy (COST) trial. Evidence such as this may finally start to turn the tide in favor of laparoscopy. The goals of laparoscopic right hemicolectomy (right colectomy) performed in the setting of colon cancer are the same as those for open surgery. They involve appropriate vessel ligation, creation of sufficient luminal margins, and adequate lymph node sampling. In addition, a thorough inspection of the abdominal cavity and liver surface is expected, together with the creation of a reliable anastomosis. Laparoscopic colectomy for resectable colon cancer has been reported to be technically and oncologically feasible. The general consensus, based on the literature over the past several years, is that there is no significant difference in lymph node harvest between laparoscopic and open right hemicolectomies for cancer when strict oncologic principles of resection are followed. To date, patient survival, disease progression, and cancer recurrence at port sites have been found to be equivalent between laparoscopic colectomy and traditional open colectomy. Several short-term benefits similar to those described for colon cancer have been associated with laparoscopic segmental colon resection for inflammatory bowel disease (IBD). In addition, theoretical long-term advantages include formation of fewer adhesions, decreased rates of bowel obstruction, decreased likelihood of chronic pain, and decreased incidence of infertility or wound hernias. Two randomized controlled trials demonstrated some short-term benefits to laparoscopic ileocolic resection for Crohn disease. On the other hand, current evidence on laparoscopic surgery for ulcerative colitis does not support its routine use among nonexpert surgeons outside of specialized centers. Laparoscopic colonic resection for diverticular disease appears to provide several short-term benefits, though these advantages may not translate to cases of complicated diverticulitis. There are few contraindications to performing a laparoscopic right hemicolectomy. Ultimately, the method of resection (laparoscopic vs open) cannot compromise the oncologic adequacy of resection, which is why a very well-defined stepwise technique is so vital. The right colon is derived embryologically from the endoderm roof of the yolk sac, which develops into the primitive gut tube. In the beginning of the week 3 of gestation, the gut tube separates into the midgut, foregut, and hindgut segments. The midgut gives rise to the segment of the gastrointestinal (GI) tract extending from the distal duodenum to the distal transverse colon. It derives its blood supply from the superior mesenteric artery (SMA). The terminal ileum empties into the cecum through the ileocecal valve. The cecum measures approximately 7.5 cm in diameter and 10 cm in length. The appendix extends from the cecum and measures 8-10 cm in length. The ascending colon is 15 cm long. The posterior surface is fixed against the retroperitoneum along the white line of Toldt. The lateral and anterior surfaces are intraperitoneal. 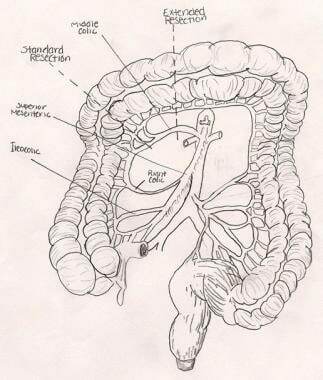 The transverse colon is 45 cm in length. It is fixed by the nephrocolic ligament at the hepatic flexure and by the phrenocolic ligament at the splenic flexure. It is completely invested in visceral peritoneum. The colon has specific characteristics that distinguish it from other parts of the GI tract. Omental appendices are bodies of fat enclosed by peritoneum. Taeniae coli are three bands of longitudinal muscle; haustra form between the bands. All vascular structures and lymph nodes are located in the mesocolon. It is easiest to visualize the colon mesentery as being no different than small bowel mesentery. Both mesenteries attach at a 90º angle and contain arterial, venous, and lymphatic channels. The right colon differs from small bowel only in that the bowel and its mesentery are "plastic-wrapped" to the retroperitoneum. This distinction is important because in order to resect this bowel, the colon and its mesentery must first be mobilized from its retroperitoneal attachments; only then can a segmental resection with lymphadenectomy be performed. The arterial supply branches from the SMA to the ileocolic, right colic, and middle colic arteries. The SMA territory ends at the distal transverse colon, where the inferior mesenteric artery (IMA) takes over to supply the left colon. A marginal artery network is the anastomotic web between these vessels along the mesenteric border. Vasa recta branches of the marginal artery directly supply the bowel wall. The middle colic artery is the most proximal branch of the SMA, supplying the proximal and distal transverse colon via the right and left branches. The middle colic artery is completely absent in as many as 25% of individuals; it is replaced by a large right colic artery. The arc of Riolan (meandering mesenteric artery) is a collateral artery that directly connects the proximal SMA to the proximal IMA and may serve as a vital conduit when arterial occlusion occurs. 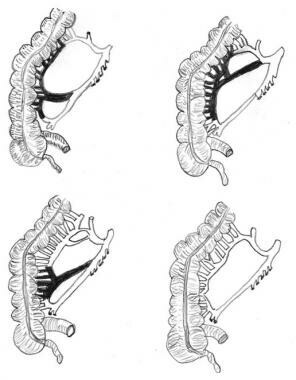 Many variations of the right colic artery anatomy exist (see the image below). It arises directly from the SMA in approximately 40% of individuals, from the middle colic artery in 30%, and from the ileocolic artery in 12%. It is completely absent in 20% of individuals. The Gerota fascia is perinephric fascia that encloses the kidneys and adrenal glands. Superiorly, it tapers over the inferior diaphragmatic surface. Medially, the fascia crosses the midline and is contiguous with the contralateral fascia. Laterally, the Gerota fascia is an open potential space that contains the ureter and gonadal vessels. The white line of Toldt represents the fusion of colic mesentery with the posterior peritoneum. An adenomatous polyp is a mass projecting into the lumen of the bowel. These polyps are classified by their gross appearance as pedunculated or sessile and further classified by histology as tubular or villous. The most common colonic polyp is a tubular adenoma. The incidence of carcinoma in a polyp depends on size and histology. Because of the close proximity of the duodenal sweep to the ileocolic pedicle, the duodenum is at risk for sharp or cauterization injuries. To prevent such injury, the duodenum should be identified and gently swept away prior to dissection and division of the ileocolic pedicle. Aberrant anatomy must be taken into account. In 10%-30% of cases, an additional right colic vein arises from the ascending colon and drains into the SMV below the third portion of the duodenum. In some patients, fusion of Gerota fat to the posterior aspect of colon can increase the risk of either entering Gerota fat or dissecting posterior to the kidney during lateral mobilization. This problem is prevented by pushing down on Toldt retroperitoneal fascia and ensuring that the dissection planes remain anterior to it.